I enjoy visiting local art galleries, finding a painting I like, then learning more about the painting and the artist. 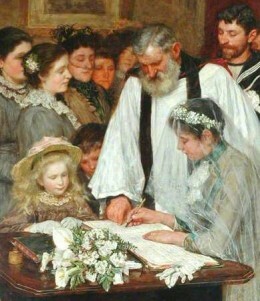 This one is called ‘Signing the Marriage Register’, painted around 1895 by James Charles. It hangs in the Cartwright Hall gallery, Lister Park, Bradford. It is typical of 19th century genre paintings, which were very popular at that time. I like it for its close observation of people, detail and symbolism. (Image: Copyright – Bradford Museums and Galleries; available via WikiGallery). This is a large canvas: 238.5 x 184 cm, and is an oil painting by the British artist, James Charles (1851-1906). It hangs on the wall of the splendid Cartwright Hall Gallery, managed by Bradford Metropolitan District Council, West Yorkshire, and located in the city’s Lister Park. The painting is quite arresting, and I like it for the detail and for its social observation. 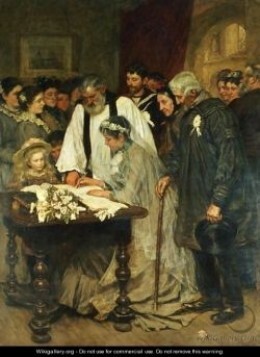 It depicts a marriage in the vestry of Bosham Church, Sussex, on the South Coast of England, in the late 19th century. We know that the artist used family members and Bosham village residents as models. His daughter Marion is the young girl in the large straw hat that peers over the table, intent on the proceedings; another daughter, Nina, his eldest, is standing at the foreground of the group of bridesmaids to the left of the picture. The ‘Minister’ was the village blacksmith, the bride’s father in the smock was a local famer, and the ‘bride’, a local girl, Annie Curtis. The composition of the painting is effective in focusing our attention on the bride. There are two groups of people in the background, left and right of the central group. They are all casting their eyes downward, and most do not seem to be looking at the actual signing of the register. This seems rather unnatural, but the effect is that they act as a type of artistic ‘funnel’, leading our eyes downward and onto the central group. The bride is the centre of our attention. She wears a grey wedding dress, with splashes of white, which stands out against the brilliance of the clergyman’s vestments. The eyes of the vicar, and all those in the central group, are cast toward the register, which holds our eyes with its whiteness. The bride’s parents stand next to her; the sailor groom is in the background. The bridegroom’s parents appear to be from a agricultural working class background. The father wears a new smock, is carrying a silk top hat, and his leather shoes are brightly polished. The bride’s mother wears a modest black bonnet. The signing of the register was the last time a woman would sign her maiden name – that of her father’s – before taking her husband’s name. Marriage was often the only means a single woman could gain a degree of independence and status, although she was moving effectively from the control of one man, her father, to another, her husband. To be unwed beyond thirty was considered a disgrace for a woman, and made her future vulnerable and uncertain, particularly when one or both of her parent’s died. Often unwed daughters became reliant on brothers or other relatives, who resented the extra expenditure and responsibility. So marriages were entered into, often at first with relief, but then with a realisation that this partnership was for life – with or without love. Divorce among the rural classes was unthinkable – and quite impossible because of the cost, shame and legal implications involved. To marry a sailor would have meant security and a husband with a regular, well-paid occupation, so this marriage would be regarded as a ‘good one’ (economically) in rural working class circles. It is interesting in this painting to see where the bride’s father is standing. He is standing on the folds of her wedding dress, with his stick planted squarely on it, too. As the painter has positioned all his subjects in a careful way, it is likely that this was done for a symbolic purpose; arguably, to show the control the father had over his daughter right up to the point the register was signed. There are white lilies on the table – symbol of purity. But notice too, the fallen white flower close to the father’s shoe. Weddings were, of course, sexual rites of passage for both groom and bride, but particularly the latter. The fallen flower suggests the loss of virginity that would follow on from the wedding ceremony. 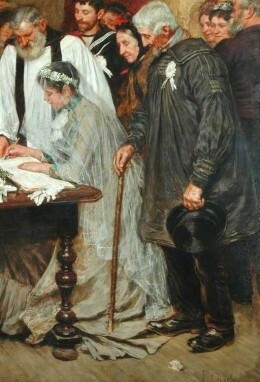 The painting also shows the family life cycle, with young, old and middle-aged together united by the wedding. The children in the painting are representative of the new life that can flow from marriage. The young girl looks on with great interest at the event. Before too long it will be her turn. And life goes on. James Charles was born in 1851 at Warrington, Lancashire. He was from an artistic background: his father was a designer and James went to work for his father, aged 14, as a draughtsman. James studied art at the Heatherley School of Art in London, then at the Royal Academy, and later in Pars, where he was influenced by the ‘plein-air’ art movement (working in natural light). He was a successful genre and landscape painter and exhibited his work in London and in Paris and was awarded a Silver Medal at the 1889 Paris International Exhibition. He lived in London, before moving to Sussex, close to where he painted the work shown in this article. He died in 1906. Did you know you can find copies of your favourite paintings on the BBC website? The BBC ‘Your Paintings’ will help you find online copies of paintings in most of the major art galleries in Britain.